Home » Who will control Syria? The Islamic State’s downfall has left a power vacuum in Syria. Iran, Turkey, Saudi Arabia, Russia and Israel are all very interested in who fills that power vacuum in the country. Currently it is Iran who is best positioned in the country and has the deepest relationship with the Assad regime in Syria. Turkey is very much anti-Assad and is most concerned that Syrian Kurds could fuel an uprising of the Kurds in Turkey. The more Turkey and Iran are focused on competing for power in Syria, the less focused they are on competing with Russia. 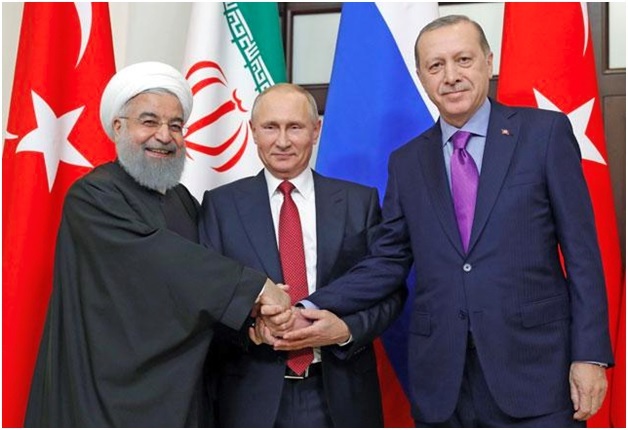 Putin has polite relations with Turkey and an even stronger partnership with Iran, but Middle East relationships are a short-lived relationship that change very quickly. Israel has been most concerned about Syria. On February 10th, an Iranian drone crossed into Israeli territory and was shot down. Israel responded to the Iranian intrusion by dispatching fighter jets to attack targets in Syria, including the Tiyas air base, near Palmyra, where the Iranian drone apparently originated from. Syrian anti-air systems reacted, striking an Israeli F-16, which crashed after making it back to Israeli territory. This pressured Israel to smash eight Syrian targets and four Iranian positions. Russia and America are hoping that tensions between Iran and Israel do not escalated into a war between these nations. Everyone in the region is fixated on the question, who will gain the upper hand in Syria? Israel is watching Iran’s involvement in Syria very closely. It is one thing for an Iranian proxy like Hezbollah, with its reduced number of fighters, to fire rockets at Israel from Lebanon. But when Iran begins to station missiles, massing ground forces and placing aircraft in Syria, just across the Israeli border, using Syria as a base of Iranian operations, this amounts to a deadly menace to Israel. Russia wants to preserve Syria as an independent nation and a Russian ally, not as a proxy nation used by Iran to project its power throughout the region. The Tiyas air base, which was the target of the Israeli strike, has also been a base for Russian aircraft in Syria. Russia and Israel have close relations – Netanyahu was in Russia just last month to express Israeli concerns to Moscow – and Russia is not looking to pick a fight with Israel (it relies too much on Israeli technology, also there is a large population of Russian Jews living in Israel who have relatives back home in Russia). Saudi Arabia… The Saudis, who as recently as November were threatening war against Iran, hate Iran. So much so that Saudi Arabia remains extremely hostile to Iran and will support Israeli moves against it (and Saudi Arabia, unlike Israel, is within range of Iran). In addition, Egypt and Jordan remain aligned with Israel, they too fear Iran, a Shia led country. Saudi Arabia, Egypt, Turkey and Jordan are Sunni. It boils down to this; Iran is seeking to fill the power vacuum left behind by the Islamic State’s defeat in Syria. No one likes the Iranians; they stir up trouble everywhere and they threaten the leadership status quo in the Arab world—which is Sunni. Israel has been bombing targets in Syria for years to prevent Iran from building up forces in that country. Saudi Arabia, Egypt, Turkey, Jordan will allow Israel to attack Iranian targets in Syria because of their fear and hatred of Iran; Russia does not seem to mind the attacks as it too, does not want to see Iran become too dominant in Syria.